Dating doesn’t have to stop once you reach your 40s and beyond. With second marriages increasing and people living much longer, there have never been so many choices for older singles. Although SeniorMatch isn’t the busiest mature site out there, it’s my favorite pick for a number of reasons. Firstly it doesn’t attract the bogus people that the bigger ones like SeniorPeopleMeet do. This is unfortunate but it’s a reality of the dating world. Just like you have to be careful when you meet people in real life. So you should take the same care online too. The second reason I put SeniorMatch at the top is that they strike the right balance between web features, and self service. I have to admit, I am not a fan of dating sites that want to do everything for you! When I’m looking for love online I prefer to look around and see who I like rather than be told “this is the person for you – go and meet them”. So what you have here is a search system that helps you find people easily – and then a few straightforward options for communication. Email, chat and winks. That’s pretty much enough in my book. Oh and they do let you browse the site from your smart phone – which more and more people are doing these days. This is one of the longest standing sites for seniors. It’s not one of Friendfinder’s biggest sites but I think it’s one of their better ones. What makes it appealing is that they have a very active crowd of mature members. The social areas of the site are the forums, group areas and blogs. These are run and moderated by the members themselves. You can join in the group activity or just use the dating portion of the site. The forums are actually a reliable and easy way to get to know people. So I do recommend taking a look. Because people are more mature here, you don’t get a lot of the bickering and none sense that goes on at other places. 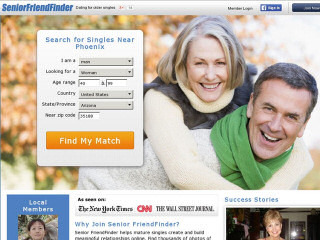 SeniorFriendfinder does have a sophisticated website that takes a bit of getting around. That’s a drawback at first, but once you get the hang of it things fall into place. The search tool always bothers me because it’s set up to show you only people who match your criteria. While this makes sense, it can mean you only see one or two matches popping up – and often the same people. To fix this, just go to your settings and widen your preferences. I put this one in to mix things up a bit. OlderWomenDating has a bit of an odd agenda. What they do is bring together older women and younger men. Apparently, this is quite a popular thing these days! With many younger men looking for age and experience rather than youth and beauty, this type of idea can only grow in size. They don’t actually give any age ranges so you can join up whether you’re a young guy looking for a mature women a couple of years older than yourself. Or maybe you’re an older women with lots of life left in you. You now want to date a young, fit man who’s full of life and energy! The layout of the site is fairly standard. I was able to create a picture profile in a few minutes, and shortly after was browsing around and hunting for dates. They also have Apps and mobile access. While the “matching” on the site is free style, that won’t bother many people. You just go in and see who you like. Send them a message and hopefully romance blossoms. While Match isn’t actually just for seniors, a big proportion of the site’s clientele are let’s just say more mature than average. You can find people on there in there 30s, 40s and well beyond. Whereas places like Tinder.com and Zoosk seems to be ever more dominated by the younger crowd. 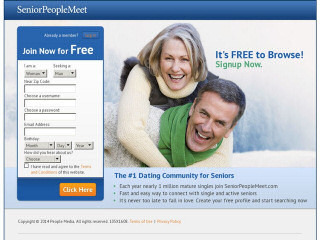 This makes Match.com a decent choice for older folks. Match is well suited if you looking for friendship or a deeper romance. Though on balance it does tend to attract those looking for romantic connects than just flirting. What’s offered is through membership is certainly as advanced as you will find anywhere. 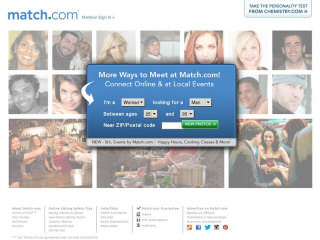 Unlike eHarmony users can choose to either be matched, in auto mode as it were. Or just browse around and find people in a more spontaneous way. If you choose to be auto matched you need to fill out the personality questionnaire and let the site do the rest. It will suggest people every day or two who might be suitable. One thing I found is that setting restrictions – or deal breakers – is advisable. This will prevent you from being match with people you’d find unsuitable or who live miles away. This is one massive website. With nearly half a million older singles, it’s the largest one out there by miles. Now I have to say it doesn’t have the best reputation in the world. Some people like it others hate it. Only trying it out will really let you decide. If you check out the user comments for this site, there seem to be two things that annoy users most. The first being hidden charges. And the second is scammers. Now if you’re a savvy user you can probably avoid both of these issues if you really tried. Firstly, the hidden charges. One thing to do when signing up to any service is to read the fine print. I know it’s boring and takes longer. But the number of people who sign up to services without checking the charges and what’s involved are enormous. Don’t reveal personal information until you really know them.